Attitude towards Acne has always been a funny thing – we are thought to think of it as something that just happens to us and that we have to accept. Well they are wrong! 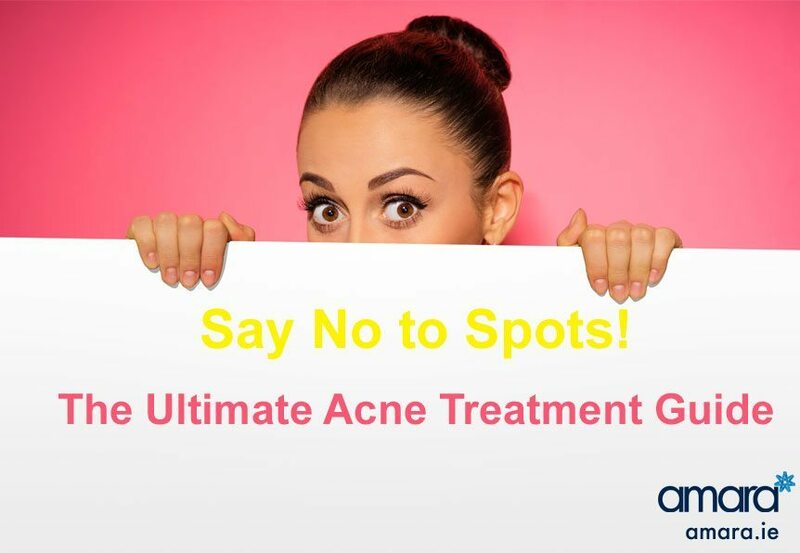 Spots are not something we have to live with – find out how to say no to spots with our ultimate Acne Treatment Guide! Acne is one of the world’s most under treated diseases – despite 15% of Ireland’s population suffering with Acne – (Acne not spots). About 90% of people will suffer with spots at some point, luckily if these are treated correctly then they should have no lasting damage to the skin. There’s actually little difference between spots and Acne – merely quantity! Those who suffer from Acne have spots but those who have spots may not have Acne! Acne sufferers rarely have a complete break from spots, and typically it is caused for hormonal reasons or likely diet or stress. Pimples (some filled with pus). They can also be painful and leave physical as well as mental scars if not treated correctly or taken seriously. How can we treat Acne? Under Law anything under Cosmetic cannot change or affect the skin cells – thereby leaving it unable to do any to actually stop Acne for good or prevent it from coming back. Anything that can be bought over the counter or online can be considered Cosmetic. Cosmeceutical products must be purchased in a clinical or medical setting as they can actively change the skin. What Acne Treatment Products work? Luckily there are Acne Treatments that work! The Zo Skin Health and medical range is FDA approved and tackles Acne-not only removing the current spots but improving your Skin Health to prevent Acne from occurring. One of the more important things about Acne treatment is removing the oil from your face at night. You should never sleep with oil left on your face overnight as it builds up bacteria and encourages spots. Oilacleanse contains Salicylic Acid and Tea Leaf oil. Salicylic Acid is the saviour of Acne sufferers, is it also fantastic for a variety of other skin conditions such as blocked pores. The Salicylic Acid clears clogged pores preventing bacteria from sprouting spots. The Tea Leaf oil acts as an antioxidant and inflammatory calming down the skin and breakouts. Therapeutic exfoliating beads help with removal of dead skin cells and also melt on to the face leaving no waste. Part of the ZO Medical range the ZO Cebatrol Control pads contain Salicylic Acid to remove oil and also improve skin surface. The high concentration of Salicylic Acid works on cleaning the pores and also helping resurface any bumps on the skin. A combination of Salicylic, Glycolic and Mandelic acid promotes exfoliation of the skin as well as keeping it clean. These also work together to reduce irritation and inflammation. Aknetrol creme contains 10% Benzoyl Peroxide to treat and prevent Acne. Benzoyl Peroxide works on the skin by reducing the bacteria in the skin and encouraging the skin to peel . The Aknetrol is added only to spots after cleanser and Cebatrol have been used. It also contains antioxidants and anti irritants to help reduce redness and calm the skin. The Akne Bright spot stick is fantastic for targeting upcoming spots fast. This tiny tube has become a favourite at Amara. Encapsulated Salicylic acid directly targets the spots to keep the area clean and free of oil. Glucosamine, broccoli extract, and sunflower seed oil – Reduce redness and helps calm and soothe inflamed spots. Also containing LiquiPatch™ which Forms an instant, invisible intra-epidermal patch to help deliver all of these ingredients and prevent damage. The newest spot fighting edition! This targeted spot treatment targets Acne while covering it with makeup. Contains Salicylic Acid and Tea tree oil, Salicylic acid actively fights the spot while tea tree oil keeps it clean and reduces inflammation. Available so far in Light or Medium. Say no to spots now! Book in now for your ZO Skin consultation with our Skin Health Specialist. Pingback:	Do You Have Rosacea? Treat It Now With This New Amara Dublin Treatment!